In September 2018, we held a Discovery Day at our White Barn property. The hit of the day was Skyhunters in Flight, presented by Falconer Brian Bradley. Here are highlights of this wonderful demonstration. April 22: Earth Day will also see NLT hold it’s annual meeting at the Norwalk City Hall Community Room. Beginning with conversation and nibbles at 6 pm. Featured speaker at 7 pm will be Louise Washer. She will be introducing the Pollinator-Pathway to Norwalk. 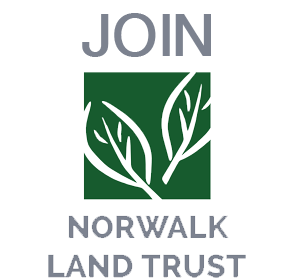 Norwalk Land Trust was selected by the National Fish and Wildlife Foundation for a matching grant of $20,000. NLT will develop a salt marsh restoration demonstration program, improving 5-8 acres of degraded intertidal salt meadow. Tax Help Recent Federal legislation provides help to conservation non-profits such as the Norwalk Land Trust. First, the tax-deductibility for conservation easements is now permanent. Second, the ability to make a direct donation out of your IRA (if you are over 70 1/2) to any non-profit is tax-free, permanently. AMAZON SHOPPERS: Amazon teams up with the Norwalk Land Trust. Enter the Amazon website via www.smile.amazon.com and direct a small percentage of your purchase to the Norwalk Land Trust. Easy, easy and every little bit helps. Thanks. Fodor Farm History We are proud to have been an early supporter of Fodor Farm. Donate easily via credit card online! Click the button below.